What are the fastest growing professional services firms doing… that everyone else isn’t? This is the question that Hinge Marketing seeks to answer in their annual “High Growth Study”. We had John Tyreman and Lee Frederiksen on the show to discuss their 2018 findings last year. Now John is back to share with us the latest from 2019. Some things have changed. Others haven’t. 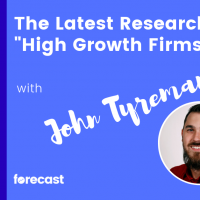 Tune in for all the details — including the Five Hallmarks that all high growth firms attribute to their above average growth.